About every eight years, C-SPAN asks 90-plus presidential historians to rate US presidents for their overall leadership effectiveness. 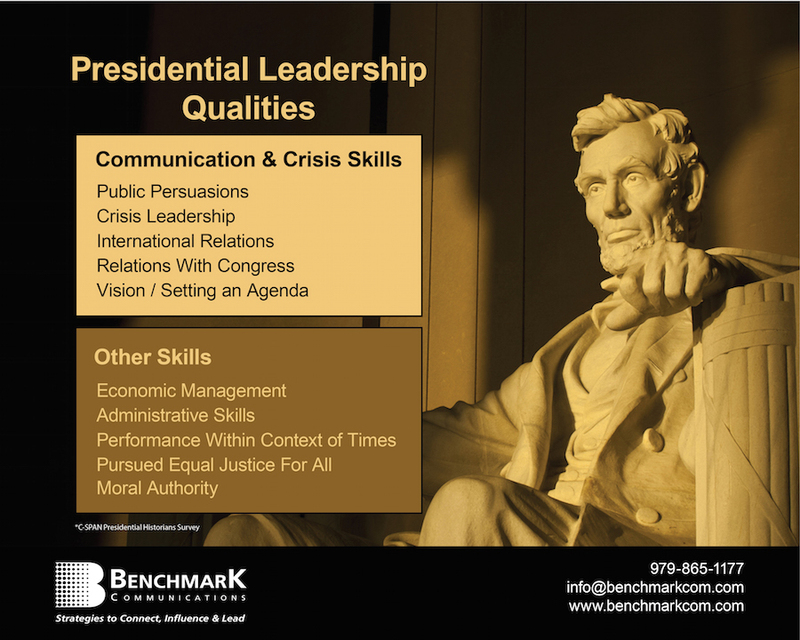 It is not surprising that communication and crisis skills are at the heart of these rankings: Public persuasion, crisis leadership, vision / agenda setting and relationship skills and are nestled in the ten characteristics that determine these rankings. 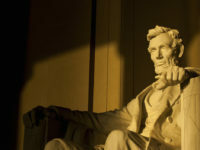 Historians again crowned Abraham Lincoln as the most effective president in history in the latest rankings, and his crisis leadership score continually tops the charts, standing at a very strong 97.8. The US Civil War was quite a little crisis and his leadership skills were put to the test through some dark and bloody days in American history. History also judges companies and corporate leaders on their crisis leadership. Weekly, you see news headlines about organizations and leaders dealing with crises that can be devastating to their careers, employees, customers – and even their very existence. The Weinstein Company, The Podesta Group, Uber, Equifax, Volkswagen, Wells Fargo, Takata, United Airlines, CBS’ Charlie Rose, NBC’s Matt Lauer – a very long and growing list of crisis casualties. Crises come with consequences. Some organizations are either sold or go out of business altogether. Some fire their leaders, while others limp along and recover over time. Still, others rebound quickly and enjoy even more public and stakeholder support once the dust has settled. Whether an organization dies, survives or thrives is greatly determined by its leadership – before, during and after a crisis. What makes an effective crisis leader? How do they think? How are they motivated? Many claim the mantle of “effective crisis leader”, but in truth, that title belongs to a very small and elite circle of people. In our 25-plus years of helping companies prepare for and manage crises, there is one leader that continues to rank as one of the most effective we have witnessed in corporate history. Jim Hart was Vice President of Public Affairs for Texas Eastern Transmission Corporation (TETCO) when the company suffered a catastrophic failure on one of its large natural gas pipelines. Jim received the call no leader wants to get; a violent explosion had rocked a highly populated neighborhood in Edison, New Jersey. The New York Daily News described it as “Hell on Earth”, and you could truly say it was a cold night in hell when CNN aired live footage from its New York studios of the crazed fireball roaring like an enraged lion into the night sky. It was so huge, that some airline pilots thought they were witnessing a volcanic eruption. TETCO’s Director of External Affairs, Jack Barnett, was home in Houston sleeping when his phone rang around midnight, “I remember our New Jersey manager telling me to turn on CNN, because we were live!” The incident was the lead story on all major news networks the next day and media outlets camped out near the explosion site for more than six weeks. George Spadora was Edison’s newly elected mayor when this devastating disaster erupted from the ground. Today, Spadora practices law in New York. He recalls that he was up late reading a book at his home several miles away from the blast site. “All of a sudden, instead of a midnight sky, it was like daylight out my window. My phone started ringing, and a driver quickly arrived at my house to take me toward the fireball. I remember thinking, ‘So, this is what it is like being mayor… If I were not mayor, I would be driving away from this thing’! We had no idea what had exploded. We just knew it was big, and we were driving towards the fireball,” says Spadora. Over the next twenty-four hours, the Mayor and other Edison officials assumed hundreds had perished in the incident, and cadaver dogs were summoned. The explosion shook more than 2000 people from their sleep at a nearby apartment complex. Some thought a plane had crashed, while others thought the world was simply ending. But, it was just the beginning of one of the largest catastrophes in pipeline history. People were scrambling out of their beds, grabbing their family members and running for their lives into a swampy, wooded area behind the apartment complex. Miraculously, all residents escaped with their lives. The heat was so intense that the residents’ automobiles immediately started melting and bursting into flames. By dawn, hundreds of media outlets had converged on the smoldering and nightmarish scene, along with TETCO’s leadership team. The New York Times described the area as a battlefield with a crater. More than 400 families found themselves suddenly homeless. They stood shaking in the cold morning air; in shock and realizing they had lost virtually everything but the pajamas on their backs. Early the next day, Jim Hart arrived on the earth-scarred scene. Under his command, the company had provided all types of training for employees to strengthen their leadership, stakeholder engagement skills and crisis communications capabilities. Jim felt fortunate that TETCO’s management had backed his proactive approach; it had marked a shift in their culture and thinking. His team had tested their crisis plans many times over the years and now they were facing the biggest test of their careers. Jim knew the public and media would be judging their every word and action. Over the following weeks Jim’s team conducted hundreds of media interviews, answered countless stakeholder phone calls and worked around the clock with local officials, regulators, residents, politicians and others to address the incident and return the area to normal. Jim’s team won many prestigious PR awards for their crisis leadership and communication strategies in Edison. More importantly, TETCO earned the trust of key stakeholders and even the news media because of their approach. The goal of this special 3-part series is to help today’s leaders gain deeper insights into effective crisis leadership and decision-making. For legal reasons, companies cannot always be frank about what they learn in the immediate wake of a crisis, but time has passed and we reached out to key leaders in the Edison crisis response. Jim has retired to his family farm in Florida, where he is active with charity groups and grows high-quality hay for area farmers. He also certifies aspiring pilots at a local airport and serves on the airport’s Board of Directors. We also reached out to a couple of Jim’s key team members in Edison. Today, Jack Barnett is Chief Communications Officer for the Harris County Appraisal Office in Houston. Keith Schmidt is a PR and Crisis Consultant with Benchmark Communications, as well as a guest journalism instructor at The University of Texas. George Spadora, who was Edison’s newly elected mayor during this crisis, today practices law in New York. Effective crisis leaders are problem solvers. They also focus on the future, and have a lot in common with movie directors like Steven Spielberg. In Part 2 of this special series on successful crisis leadership, you will learn about Jim Hart’s strategies, thinking and motivations as he fought off lawyers and battled daily to solve five major problems that erupted during the Edison crisis. Later, in Part 3, you will see the results of Jim’s motivation assessment test that reveals key leadership filters that greatly influenced his decision-making and crisis leadership strategies in Edison. NOTE: If you would like to be notified when Parts II and III are available, see our subscribe button at the top right of this page. ** Benchmark Communications was honored to work with TETCO before, during and after the Edison crisis. TETCO’s PR leaders and crisis communications team were instrumental in creating a stakeholder-centric culture that was key to the company’s success in Edison. Their leaders also credited Benchmark’s crisis management strategies, media crisis training and stakeholder engagement programs for contributing to their stakeholder and crisis response approach in Edison. Got me hooked. Looking for Part 2. Awesome, Steve! We will let you know when Part 2 is published!